Hi Friends: This week's creation is a first anniversary gift for my daughter. I used the same basic photo as my layout a week or so ago (it's one of her favorites), but put it on a mixed media canvas. 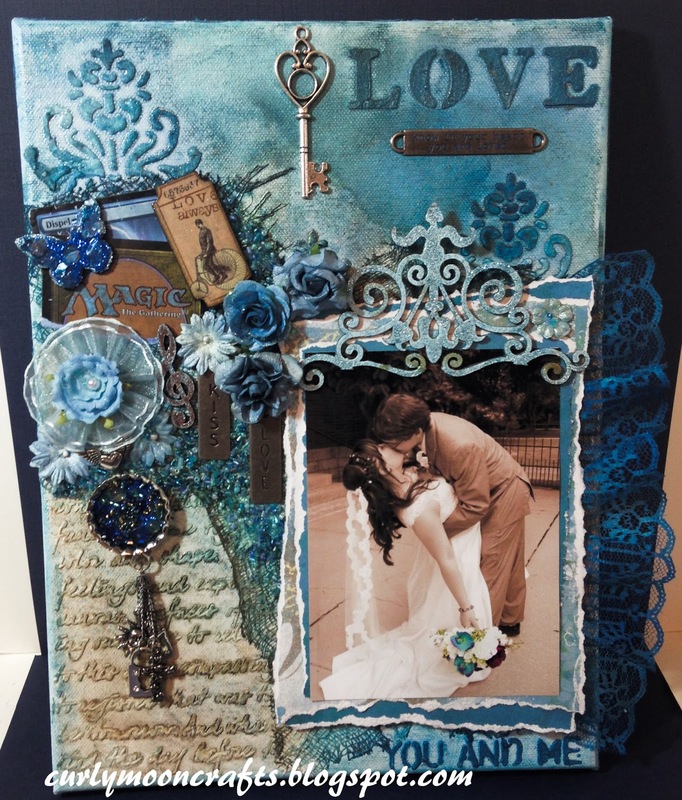 I started with embossing paste & 3 stencils to add texture / interest to the background. For the LOVE and YOU AND ME stencil, I mixed the embossing paste with a bit of 3-D Stamp Paint so that I could get the exact color I wanted. Once dry, I added a bit of cheesecloth before spraying the background with my LSG and other sprays. I backed the photo with some MME papers from my stash and popped it up from the background with some cardboard. I colored the lace and flowers with the same LSG sprays, and added blue beads to the center of the bottle cap. All of the charms attached to the bottle cap and on the canvas represent things of meaning to the couple: a cross and winged heart for their faith, a key and lock for their love and commitment, and musical notes and a sun for their participation in a college a capella group. (I added some things that represented them individually, too - the "Magic" cards for his love of that game, and the butterfly because Jenny loves them.) I added some word bands representing love, arranged the embellishments, then finished the canvas off with some lovely seed beads. Thanks for taking a look. Have a great weekend!